Freeing Body Image: International Women's Day at York St John University - Words Matter. The first workshop of the afternoon was hosted by Paula Singleton who discussed critical masculinities before we delved into her ‘super heroic dolls’ workshop. Paula took us through her PHD on men’s cosmetic surgery and ideas around how men are often disembodied (taught not to think about their bodies) and how this contrasts with how normalized cosmetic surgery has become among women who are often taught to overthink about their bodies. Most Importantly, Paula stressed that we cannot transform women’s place in society without addressing men’s place and masculinity. She referenced statistics around male suicide rates and how men are often reluctant to go to their GP yet she also mentioned that at least when they do they are taken seriously – as often women go undiagnosed with serious conditions when their problems are dismissed as ‘women’s problems’ (whatever that even means) by male doctors. I have to say though, my favourite part had to be the super heroic dolls workshop in which Paula encouraged us to explore her suitcase of crafts and makeover a doll in our own way. After twenty minutes of covering ourselves in PVA glue and trying to live out our hairdressing dreams with kitchen scissors and sharpies for hair dye, we collectively shared the concepts behind our creations. It was incredibly inspiring to hear the stories behind everyone’s dolls, from activist Barbie’s with lolly pop stick protest signs to queer president dolls to stay at home dad action men. 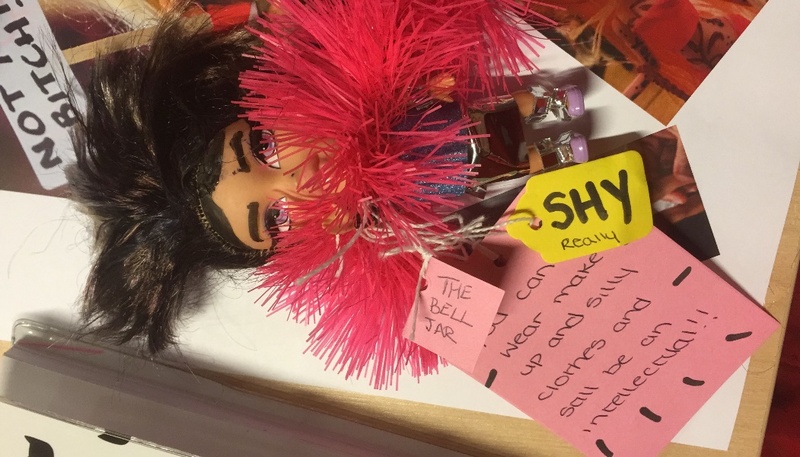 Paula’s ethos behind the workshop was to create ‘dolls that say what you want them to say’ as opposed to the rigid gender roles they so often perpetuate, and I can safely say we did exactly that. After a quick tea and biscuits break, we all regrouped to hear a lecture on ‘selfie-objectification’ by Dr Beth Bell. After brief discussions earlier on the topic of the normalization of things like lip fillers, Beth Bell delved further into this concept of women being taught to be unhappy with themselves through the lens of Instagram. Beth defined ‘selfie-objectification’ as thinking about your body from an external point of view. She revealed shocking evidence that when girls think their body is being evaluated they are more likely to develop disordered eating, be less talkative, less likely to stand up for equal rights and be more likely to have reduced maths and sport performance. Beth highlighted how the influence of magazine cover girls and celebrities being objectified was encouraging girls to objectify themselves in selfies but did stress that hope is not lost! Linking to body positivity Instagram influencers, Beth showed us how social media can be subverted and also mentioned the importance of social media breaks. This talk was really interesting and even made me revaluate how I use Instagram myself. The finale of the day was the Embrace documentary which Liesl introduced with, “if you’ve got a body this film is for you”. Embrace was a documentary following Taryn Brumfitt interviewing all kinds of people about their bodies. The film took us through stories about the modelling industry, pro-anorexia websites, and the dangers of photoshop. One of the most outrageous moments was when Taryn visited a male cosmetic surgeon who told her everything ‘wrong’ with her body and how her breasts, thighs, etc were ‘supposed’ to look (which got a gasp and a laugh from the whole audience as we collectively rolled our eyes at the ridiculous way he thought regular women’s bodies looked). The biggest takeaway from this documentary was Taryn’s motto of your body being a vehicle not an ornament. The film ended with her saying she wanted to be a role model for her daughter which was very touching and inspiring. I left thinking I’m going to recommend this film to everyone as it felt so incredibly important. The whole day was incredibly fun and thought provoking. It was great to see women coming together at our university to celebrate international women’s day and I hope this only continues! Next PostNext Are you looking for a career teaching English in a secondary school?